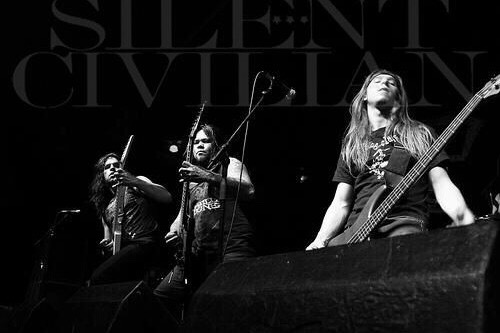 Fundraiser by Dave Delacruz : SILENT CIVILIAN - New Album/Tour! SILENT CIVILIAN - New Album/Tour! We’ve made a promise and we are sticking to it. Silent Civilian is back! We are raising funds to help support the THIRD official album and follow it with a tour! But... we do need your help! We invite you to be apart of the creating process! That process can be all time consuming, very expensive, and in order for us to deliver the best possible album we know we will give you and in a timely matter, we need to make this a full time priority. If you’d like to be apart and support our journey to deliver the new Silent Civilian album and tour, all funds raised will be going to just that! Funds will be used for the processes of timely writing, mixing, mastering, distribution of the album, physical copies and bundles, new wearable merchandise, and tour support! The album is currently in the writing process. We will deliver the album no matter how much or how little support is raised by you all, our family. Raising enough will ensure top of the line production and a timely release. We’ve been promising and hinting at this album for too long now. We are ready, We are driven, and we are working. Be apart of this amazing journey and you will be rewarded for it! First off we want to thank everyone for their generous donations! You all have been so amazing. We are promising you all donations are going to this album. We are producing the album REGARDLESS if we reach our goal. Contributions are helping us ensure that we can do this in a timely fashion with the production and quality you expect from us. We want to stress that. This is us doing this together. We are taking full control this entire process. We are coming up with some awesome gift ideas for all of your generous donations. Alongside the album, we will be including digital downloads of first released singles, digital downloads of the album, merchandise, autographed material, and some really cool bonus gifts. You all have been so incredibly amazing and we are so grateful for every single one of you.